In upcoming political thriller “The King,” Zo In-sung returns to the big screen as ambitious prosecutor Tae-soo, who yearns to wield absolute power. 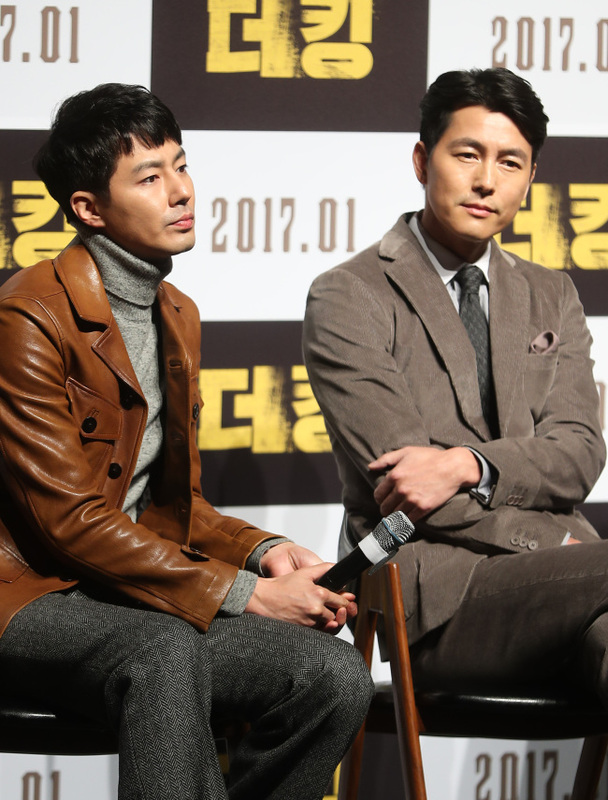 To rise to the top, Tae-soo teams up with Han Kang-sik, played by Jung Woo-sung, a kingmaker who is the real decision-maker behind the country’s politics. “I thought it was very brave,” said Jung at a Thursday press conference in southern Seoul, regarding the film’s resemblance to Korea’s current scandal surrounding President Park Geun-hye and her influence-peddling confidante. Jung wanted to “drag his character down,” he said. This is Zo’s first movie since “A Frozen Flower” in 2008. Jung starred in “Asura: City of Madness,” released in September. “The King,” produced by Woojoo Film and distributed by Next Entertainment World, will open in January. It also stars Ryu Jun-yeol and Bae Sung-woo.